Oil on stretched canvas, 11" x 14"
Framed: $900 plus $15 shipping in U.S.
Unframed: $800 plus $7 shipping in U.S.
An illness in the family has kept me away from the easel for the past few days. Here is a larger oil, painted in 2008. 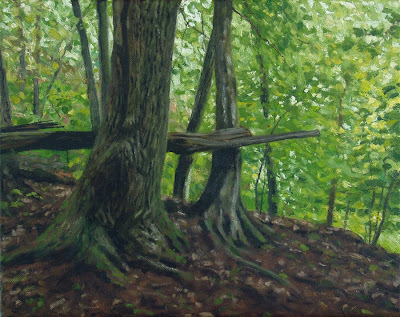 The inspiration for this painting came from a beautiful hardwood forest I walked through near Ottawa, Illinois, while I was there painting a mural. The sunlight was diffused and filtered through the thick green canopy of leaves. Click image for a larger view. the green leaves pleasently surprised me: luscious, soft canopy... just beautiful Don. r.
Beautiful light in this one Don! Love your recent "sketchy" small studies as well! what a calm feeling in this one, makes you want to sit at the base of the tree and take a nap. Rahina, you're always so supportive--thank you. Hi Robin, good to hear from you and thanks. I always enjoy checking into your blog for the latest beautiful work. Hello Pat and welcome. I enjoyed seeing your work. So beautiful, and having lived in Illinois I can appreciate the natural look of this painting. I appreciate your words, Bill.